ealth™” Induced Air Dissipative Silencer option provides maximum acoustic attenuation by reducing radiated sound power levels. The medium insertion loss design does not however affect fan performance. When units are installed above the occupied space, the addition of the silencer reduces the radiated sound level in the occupied space by a significant 5 NC. It is available as standard with Fiberglass Media. 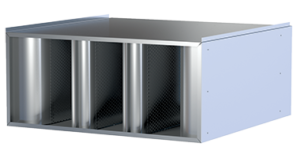 A Mylar/Spacer Liner option is also available for IAQ sensitive applications. The optional induced air inlet accessory is shipped loose for field attachment.